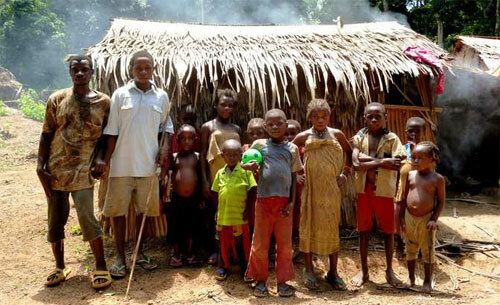 Ten years had passed since our last visit to the African rainforest. 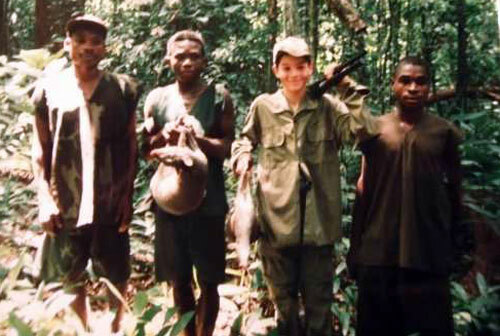 At that time, my father and I hunted the eastern part of the Shanga River in the Central African Republic. It was time to go back and experience one of the most amazing hunts you can have in Africa. 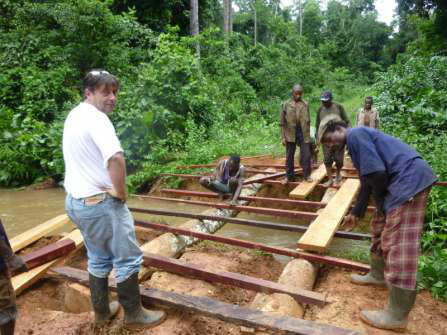 This time we were going to Cameroon, close to the Ngoko River which borders the Congo. We had planned a 13 day hunt with Jose Chelet (nicknamed Pepe) from Chelet Hunting Safaris, an outstanding guide and a good friend from Spain. The most important part of this trip was the time spent with my father. I feel really lucky to be able to share these hunts with a father who has taught me everything I know and whose passion for hunting is immeasurable. He is, without a doubt, the best hunting partner you can have. 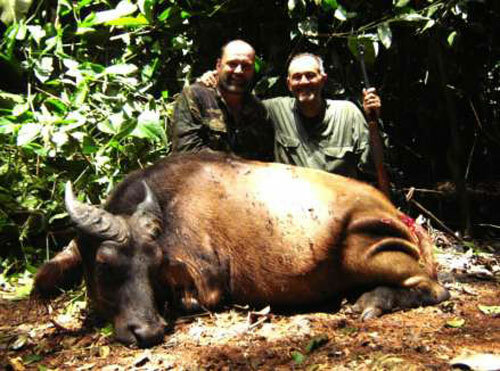 My father’s objective for this hunt was the elusive Dwarf Forest Buffalo, and the amazing Bongo Antelope for myself. Other animals were on the list too, like the forest Sitaunga, Duikers, bush pigs and the giant forest hog. 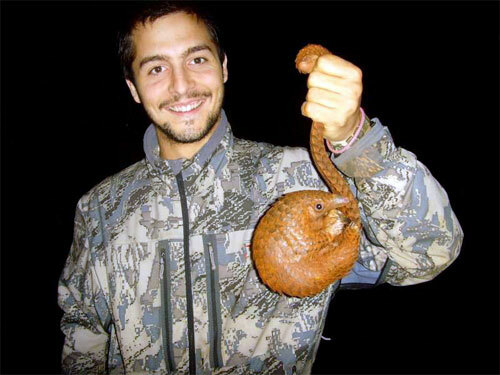 In the rainforest, you may have a target but you never know what the rainforest will give you. So you should go with an open mind. Along with the huntable creatures, there is also the chance you may get to see other non-game animals like the elusive Forest Elephant, Gorillas, and other exotic species. If there is something that you have plenty of in Africa, it is time. The real Africa welcomed us by forcing us to spend two days waiting on “paperwork” to be done in order to get the charter plane to fly to our final destination. Finally, we managed to arrive at the hunting area after many hours since we left Spain. Pepe was waiting for us at a little timber landing strip. The rainforest is overwhelming; everything is so immense, so dense and so wild that just having the opportunity to spend some days there makes the long trip worthwhile. 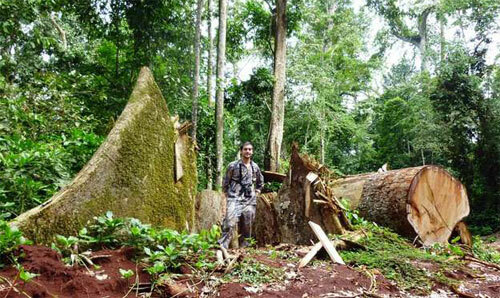 Unfortunately, timber production has hit this forest hard in the last few years. 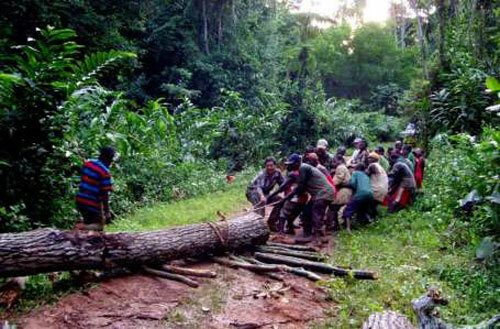 Tons of Millenarian trees have been removed from the area, breaking the forest into a maze of timber trails. 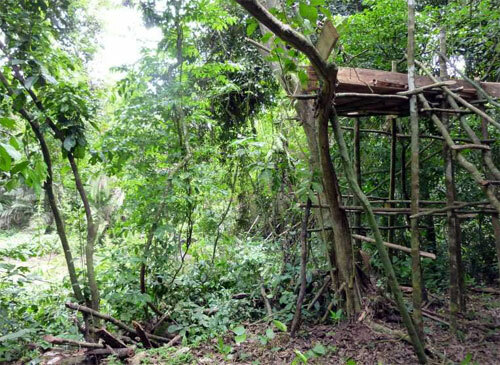 The cutting of these big trees allows the light to penetrate the forest floor, and the effect of the sun’s rays on such fertile land results in an impenetrable understory that can only be explored by the slash of the machete. 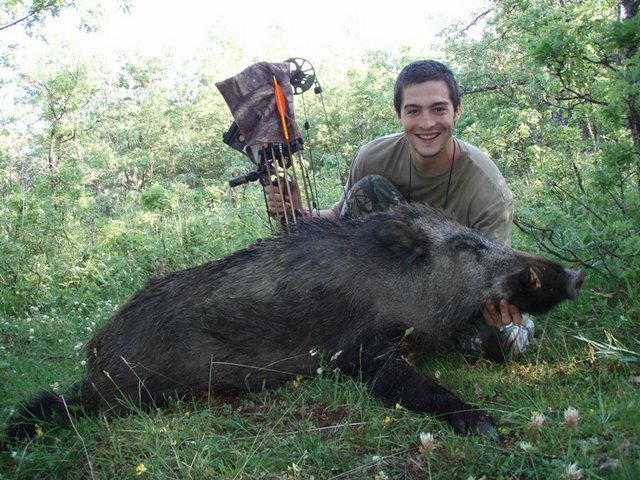 Luckily for us, we were hunting with probably the best hunters in the world, the Baka Pigmies. Their level of skill is so high, and the difference with other hunters so overwhelming that it is impossible not to succumb to absolute admiration for these small, yet great woodsmen. It is just unbelievable how they read the forest. 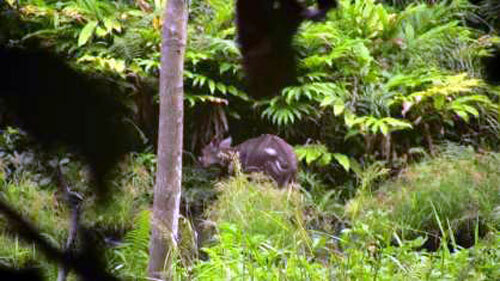 You think that you have seen it all until you see them tracking a Sitatunga under the water! Simply ridiculous. 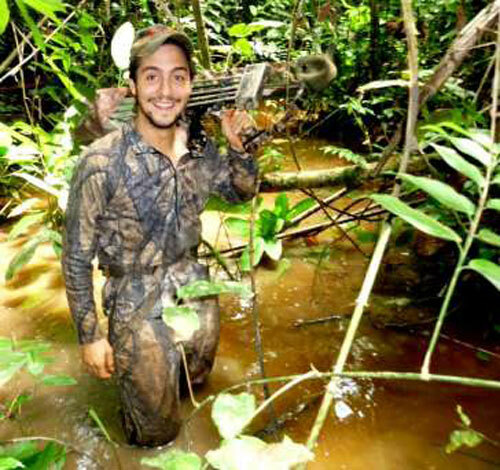 The main hunting method employed in the rain forest is tracking. You spend the morning slowly looking for fresh tracks along the timber trails. If you find something worth following, you just go after it. As the forest is so dense, it is simply impossible to get to the game without the help of a few little dogs. While tracking, they stay close by you and together with the group. They know how easily they can get lost. 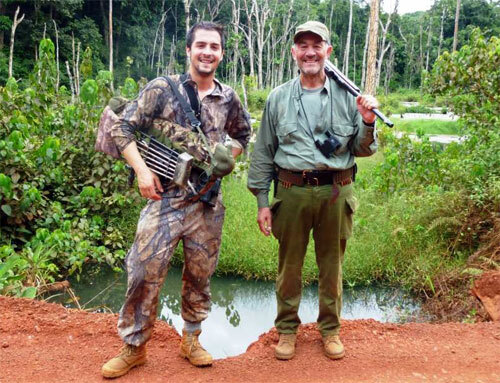 After a few hours of tracking, when you put up an animal, they go after it, and with a bit of luck they are able to stop it for a few moments -typically in the thickest part of the forest. Here the animals make a stand and face the dogs, looking for a fight. The bongo and the buffalo both end up kicking some of the dogs in the process. So with this background, you have enough information to understand what happened to us on one of the first days of hunting. While looking for a fresh bongo track, we found one that looked like a good one. Soon we discovered that it was a really fresh one, and when I mean really fresh, I mean that there was a little puddle in the way where the water was still moving! We did not have to wait long until the bongo jumped in front of us. After a few tense seconds, the dogs started barking and we were running like crazy. Even with such an amount of adrenalin in your blood, you lose all inhibitions and we were able to go through places we would never think of. In the last few meters of the chase, the run turned in to a smooth stalk, as we could hear the bongo running the dogs, but we could not see more than ten meters in front of us. 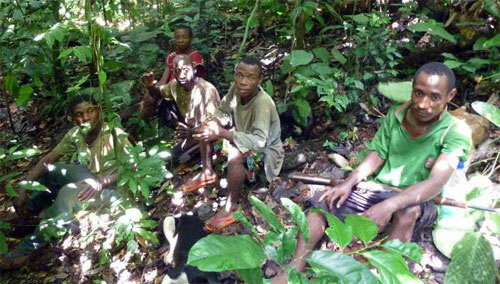 We were all behind a big tree with the bongo just five meters away running the dogs, but we still could not see it! 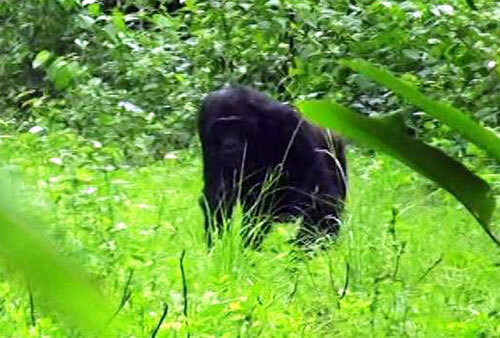 After just a glimpse of the bongo between the bush, and considering the situation, we decided to back up. It would have been impossible to get an arrow through there. One of the main problems we realized at that moment was that everywhere you turned was more of the same. Getting an arrow through there would not be easy. During the afternoons there was not enough time for tracking game, as night inside the forest comes quickly. For that reason, every afternoon my father would go to the viewpoints, placed on a few small openings inside the forest, where I would call for duikers with two of the pygmies. We had already spent a few days of hard hunting without luck. We had seen few tracks and followed up on some, but except for the bongo I described above we had no opportunities. 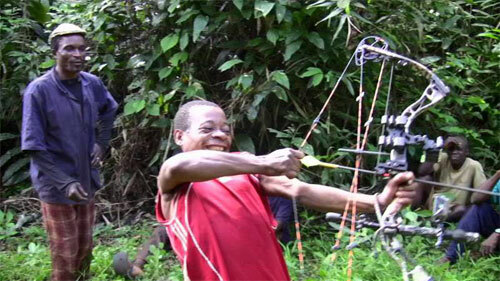 Hunting in the forest is tough, both physically and psychologically. Lots of hours walking inside the jungle, all the time bent at the waist or on our knees. Then there’s the high temperatures and even higher humidity, all which makes hunting exhausting. You also have the issue of not seeing any game at all, and that can lead you to think you are looking for ghosts. This is half true because animals can appear from anywhere and disappear in half a second with ease. But the 1st of May was different. A mysterious morning fog was hiding something that we were about to discover. It was early in the morning when we cut a lone, fresh, buffalo bull track. The track was from the previous night, so my father got down to give it a try. With him was his PH, Hancke Hudson while Pepe and I went to look for a bongo track. While going through the trails looking for bono tracks we came across something that we would have never expected. 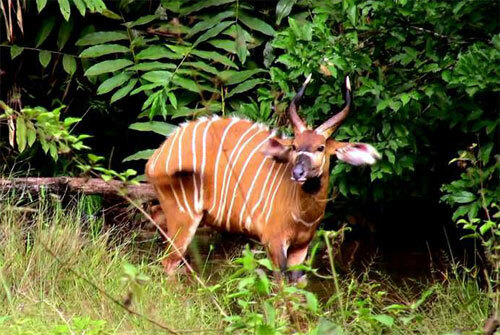 Just 30 meters from the road was a bongo taking a bath! We had it in front of us for more than five minutes and stayed there, observing it until we decided to leave it alone with its bath. Although we knew we could regret it later, it was definitively not the way of getting such a majestic animal. It was probably one of the most beautiful encounters with an animal that I have ever experienced. What are the chances of seeing a wild bongo bathing for five full minutes, just thirty meters away? As the pigmies said, it was mother forest’s way of saying good morning. As if that had not been enough, we had a second magical encounter that morning. 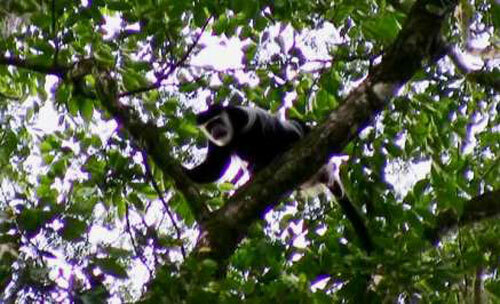 After a few days of hunting without seeing any animal, we had not only seen the bongo, but also a gorilla! 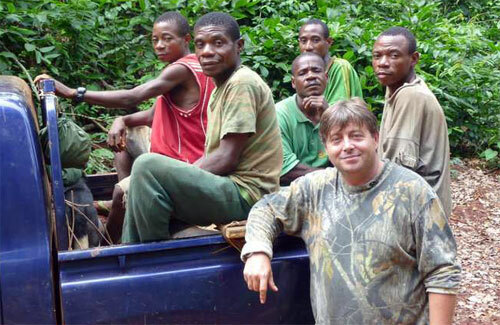 It was not until one o’clock in the afternoon when we came across a bongo track. Although it was late, we decided to give it a try. Our goal was to follow it for ninety minutes and if we did not get to the bongo, we would leave it so we could get to the vehicle before dark. 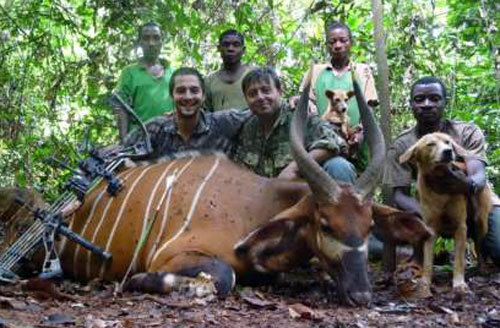 The tracking team was formed by Endeke, Rigobertte, Kema and Martin; all of them exceptional trackers. Each step was followed as though they were inside the animal’s head and all of them working together as a team. Every step took us a bit closer to our prey and a moment I had dreamed of many times before. After a little more than an hour, we heard the bongo jump and was soon followed by the dogs. A few moments later, we heard them barking; the bongo had stopped to face them. Run!!!!!!! Flying through the lianas thicket, we were suddenly stopped by the pigmies. We were very close and now it was our turn to enter into action; Pepe with the rifle, and me with my bow. We were ahead of the line, getting closer to the barking and the sound of the bongo’s charges. Suddenly we saw it, just an orange shadow only twelve meters away! Looking for a lane with better visibility, we were advancing a few meters, when a charge of the bongo at the dogs, sent him in our direction and forced us to jump out of his way. Luckily, Pepe being a very good professional did not shoot, even though the situation gave us the creeps. It was really, really close! The bongo returned to its initial position, and started fighting the dogs again. It was difficult to get a clear view. In addition to the dogs running around the animal, the bongo also kept moving trying to reach them. I needed to find a way to a clear shot. Pepe kneeled down and was ready to give me back up, so I decided to gain a few more yards and try to find a hole between the maze of tree and brush limbs. Suddenly, the bongo ran at a dog and that created a twelve inch hole. 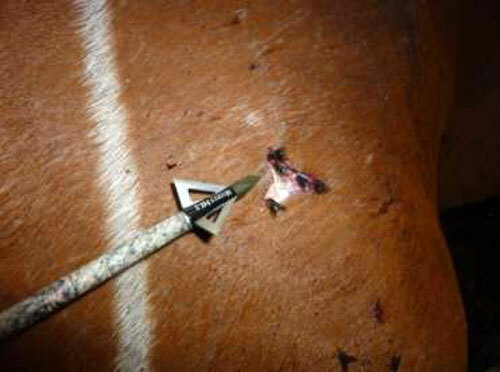 Without hesitation, I drew my bow and released my arrow as quickly as I could. The shot was just eight meters away! The arrow found its mark and I could clearly see the white blazers right behind the shoulder. I moved away from my position and told tell Pepe to back up. I knew it was a perfect shot and did not want to force the situation. Amazingly, in ten seconds, the bongo fell down, much to the astonishment of all of us. Yahooo!!!!! The restrained adrenaline exploded, and we all started shouting, hugging, and all those things that you do in that kind of moment. It was a dream come true, and one of the most exciting hunting experiences I had ever had. I don’t think I could reproduce or explain the emotion of that moment. It was in one word, unique. And so as to close the perfect day, my father was waiting for us in the camp with a beautiful buffalo! After following that morning’s track for over three hours, they jumped the lone buffalo, and when it was about to start charging, my father put a bullet from his .375 on its chest to stop it, only twelve yards away! After that initial shot, my father and Hancke both put a couple more bullets into the buffalo before it disappeared in the forest. I would have loved to be there. The 1st of May will always be a special day for us. With the main objectives fulfilled, the hunt radically changed. 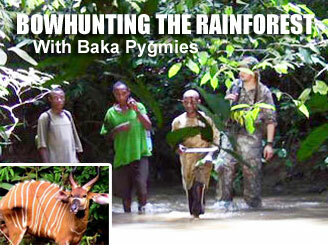 We were now going to focus on the Sitatunga and were hoping for the rainforest to provide us some luck once more. But as always happens on every adventure, there are ups and downs, and I was put down with a fever for two days and forced to rest. Thank god it was not malaria. After a couple days I was back on my feet and able to rejoin the team again with renewed strength. There isn’t a better cure for fever than a bit of sitatunga tracking; they simply love water! And after long tracks, they just vanish without a trace. That afternoon, my father went as always to a viewpoint, while I decided to discover the forest with Endeke and Mustik. 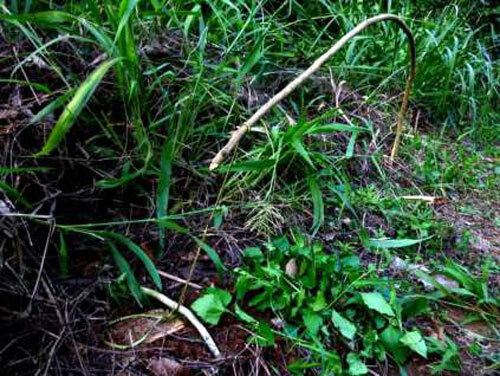 Poaching in these areas has been intense; there where snares everywhere and the most affected animals were the duikers. Years ago, you could easily call in several duikers at the same time, but this time, we were having problems bringing even one in. However, the opportunity to learn from the pigmies was amazing. I spent all the afternoon asking them things, and they taught me to put snares, to find good water, read forest signals and to track game. They would make the distress noise, and duikers would come in to help the partner (I would never understand why, since there is not much a little duiker can do). After five minutes of calling, we got up and went further inside the forest for another 15 minutes and started calling again. That afternoon nothing came in for the first five calls, but on the sixth one, and only after five minutes of calling a Peters Duiker appeared from nowhere at just six meters away. There it was, looking in our direction to see what was going on. I drew the bow as slowly as possible, and just as I reached full draw, released the arrow. There was no time to waste. The arrow flew, but I had no idea of where it had gone. Everything happened so fast. Endeke said that I had missed it. I was disappointed, as we had been working hard all the afternoon. However, I said I wanted to see the shot. We started looking for it and there was blood all over the ground. A perfect missed turned to be a perfect heart shot. We got the Peters a few meters away from the site of the shot. It was an old warrior, it only had three legs, and on one of them there was a snare. 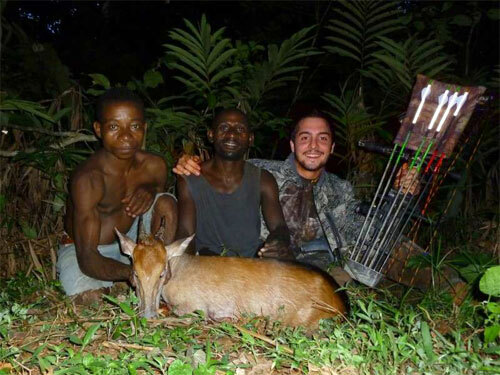 We were in the middle of nowhere, but there was the duiker with two snares, and my Bongo also had two snares. I do not know if there is a solution, but if it keeps going like this, the forest hunting is going to disappear. 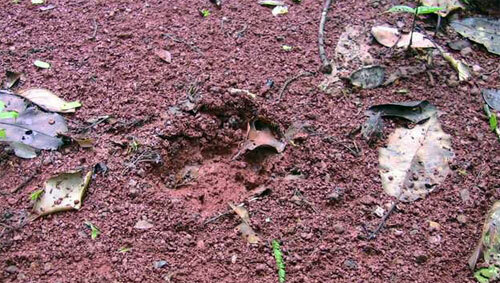 We crossed Sitatunga tracks almost every day, but getting to them was nearly impossible. We only saw one in the time we chased them; a fawn on a swamp, but that was it. We were going through some really dry days, and game movement slowed down so much It was becoming hard to cross fresh tracks. But finally it rained, and when it rains in the rainforest, you had better be prepared! It rained nonstop for a whole day and in such a way that all the bridges fell down. We had to spend a day rebuilding them. But the important thing is that everyone was happy! Every day we cut sitatunga tracks, and until the last moment of the hunt, we tried to find one, but all we managed was to hear them running. It was the fourth time my father had tried to get one of these beasts. It is definitely not an easy animal to kill. However, that gives us the perfect excuse to come back to the rainforest. Getting back home was not easy. Again, a “paperwork” problem made us lose two days waiting for a charter plane that didn’t show up. We had no other solution than to drive 24 hours straight trough those crazy, timber roads. All the while trucks driving at full speed with tons of timber loaded behind. Despite such problems and inconveniences, nothing could change the flavor of an incredible trip. The main reason why almost each year, my father and I get into one of these hunts is the adventure. You know how things start, but you never how they are going to end. We had managed to spend a wonderful time in one of the wildest places on earth, hunting with outstanding trackers, for astonishing animals. As you could imagine, after 15 days there are thousands of anecdotes, and this is just a quick summary of what really happened there. I would like to invite you to discover it for yourselves, as the trip is definitely worth it. I would like to thank Jose Chelet, for his professionalism at every moment; Hancke Hudson, for being able to stand me the whole hunt; Endeke, Mustik, Benoir, Rigobertte and all the trackers, as it would have been impossible without them; Francis, for putting some order into the chaos and of course, to my father, for letting me experience this adventure; I feel really lucky and could never be grateful enough. 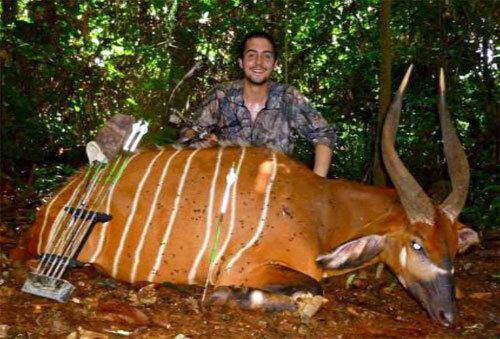 Do not hesitate to contact him (pedro.ampuero@cazandoconarco.es) in case you are interested in knowing more about bowhunting in Spain or about bowhunting in Cameroon.